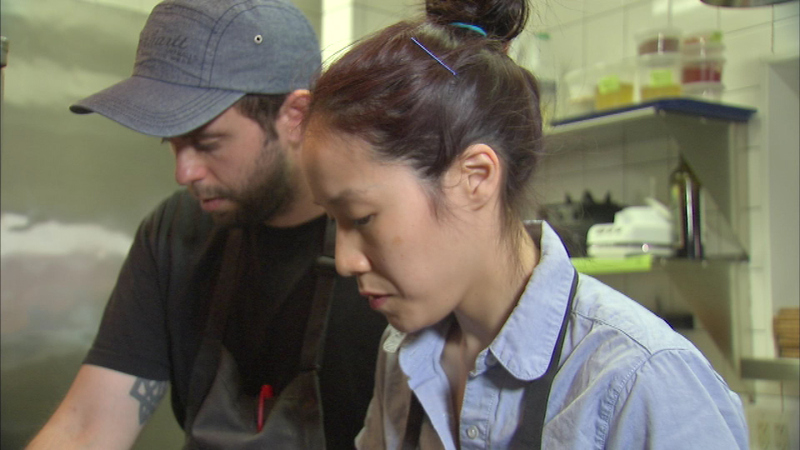 Chefs at Parachute, nominated for Best New Restaurant at the 2015 James Beard Awards. CHICAGO (WLS) -- Not only will Chicago host the 2015 James Beard Awards, but the list of nominees is ripe with local chefs and restaurants. They include Parachute for the Best New Restaurant; The Violet Hour for Outstanding Bar Program; Dana Cree at Blackbird for Outstanding Pastry Chef; and Tanya Baker at Boarding House for Rising Star Chef of the Year. Best Chef: Great Lakes boils it down to five nominees, four of which are in Chicago or the suburbs, including Curtis Duffy at Grace; Paul Virant at Vie (Western Springs); Erling Wu-Bower at Nico Osteria; and Andrew Zimmerman at Sepia. The 2015 James Beard Awards will be presented on Monday, May 4 at the Lyric Opera of Chicago. ABC7's Hungry Hound was nominated for the James Beard Foundation Broadcast Media Awards. That awards dinner will be held at New York City's Pier Sixty at Chelsea Piers on Friday, April 24. CBS This Morning's "The Dish"
WCCO This Morning's "DeRusha Eats"
"The Toxic, Abusive, Addictive, Supportive, Codependent Relationship Between Chefs and Yelpers"
"The Lost Apples of the South"
"What Happens When All-Star Chefs Get in Bed with Big Food?"